Since the time iDealBed 4i is launched into the market, there have been significant updates and certain advanced features are also added. What’s new? For example, when newly launched, it had no USB ports at all. But now iDealBed has added total 4 USB ports, 2 on each side of the bed. In fact, the company has launched another advanced model iDealBed iEscape, which includes all high-end features. It has advanced wall hugging design incorporated along with innovative NanoHook technology based mattress retention system. It also offers 8 high speed charging USB C ports, emergency power backup, LED flash light and under the bed lighting system. Price factor? While the price of iDealBed 4i remains the same, but iDealBed iEscape costs slightly more as it comes with top end features. However, it is still less than half that of advanced high end adjustable beds like Legget and Platt and Reverie, even after wall hugger design being added. Remember, iDealBed has its design, motors, new wall hugging and mattress retention system sourced from industry famous Leggett and Platt. 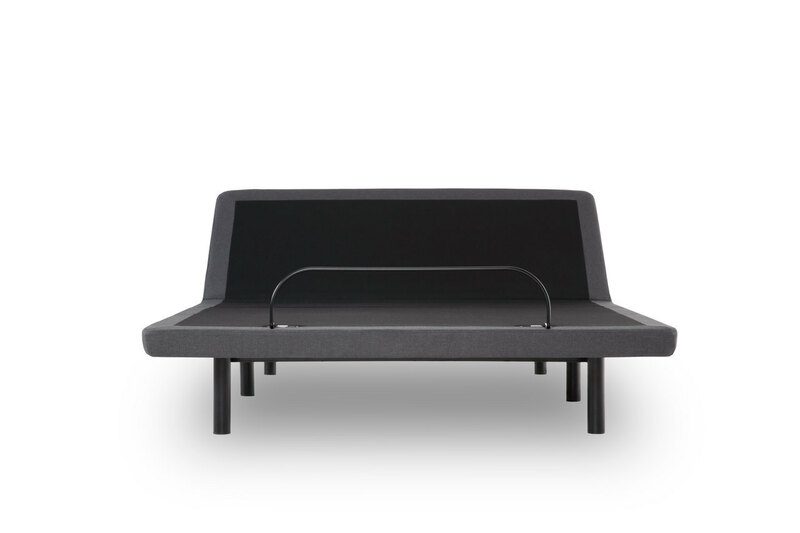 You can rather call it as most affordable Leggett and Platt adjustable bed. Just compare the advanced features it offers and the price it comes at.... iDealBed is definitely a steal. The biggest selling point for idealbed is the motors installed in it. 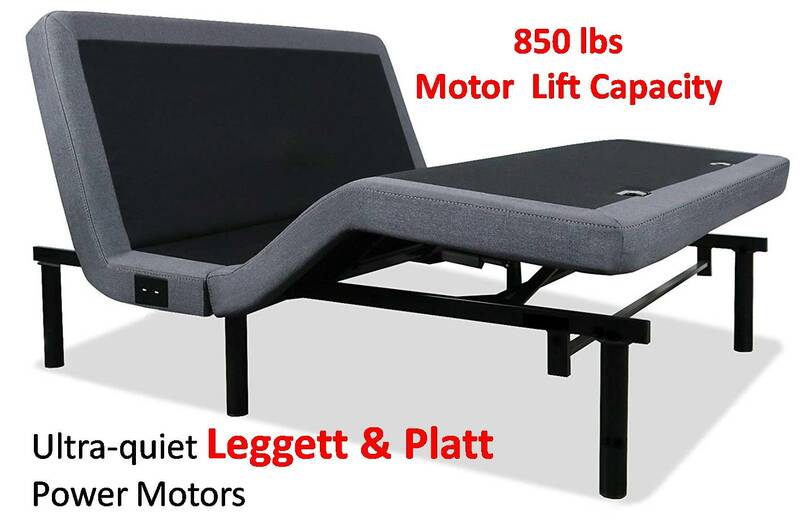 These motors along with the core design itself have been sourced by Leggett and Platt, the most trusted brand name in adjustable beds segment. Leggett and Platt beds are all high-end adjustable beds. But if there is one bed with Leggett and Platt like quality in affordable price range then it is idealbed adjustable bed. The design and the motors, that form the key elements in a bed, are from L&P. Hence, we can call it a mid-range adjustable bed from Leggett and Platt as even the support services offered for idealbed are from Leggett & Platt. In any adjustable bed, motors play an important role. Apart from offering enhanced lift capacity, the motors should be noise-free while performing various tilts including massage vibration. But the quality of motors is sub-standard in most low and mid-range adjustable beds. However, you can be worry-free when it comes to the performance of motors installed in iDealBed adjustable beds. The main reason being that the company has partnered with industry renowned Leggett & Platt (L&P) who apart from offering key design assistance, have also sourced the much important motors for iDealBed adjustable beds. These motors from L&P are ultra-quiet and have a lifting capacity of 850 lbs per unit. This capacity is relatively massive when compared to other beds falling in same category. Thanks to Leggett & Platt. The head section can be adjusted all the way up to 70 degrees while the foot section can be tilted to 42 degrees. iDealbed iEscape: The feet tilting in iDealBed iEscape offers additional three degrees and the overall feet tilting stands at 45 degrees. And this range of both head and foot adjustability is very much on the higher side. In case you wish to compare the head and foot tilts, please refer to the comparison table in our detailed adjustable beds review. While iDealBed 4i is not a wall hugger but as mentioned in the introduction, the company has launched a new model iDealBed iEscape wherein advanced wall hugging design has been incorporated. There are very few adjustable beds in the market that are wall huggers and all of these are high end adjustable beds that cost a lot of money. And if you are looking for a wall hugger in mid-range category with low price then iDealBed iEscape is the best option. 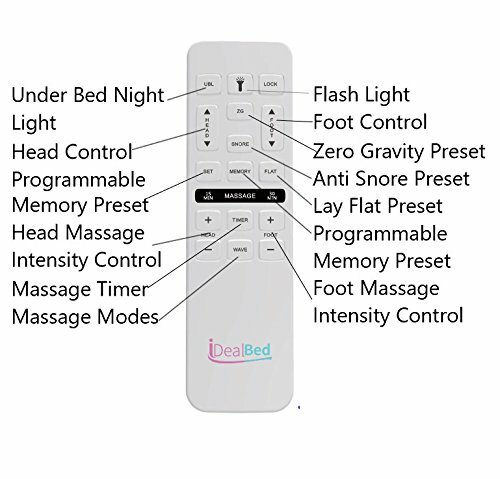 iDealBed is perhaps the only adjustable bed whose remote has altogether 18 functions. I have reviewed almost all leading adjustable beds in both high-end and low-end segment but no other remote has these many functions to offer. While Flat & Zero Gravity positions are offered by every other regular adjustable bed, anti-snore is an advanced feature which is also a part of iDealBed feature set. This function lifts the head section to a certain angle, opens up blocked air valves and helps reduce annoying snoring issue. Every individual have their own favourite positions for working on laptop, watching TV or just relaxing in a lounge position. And preset positions might not always help you achieve your favourite head and foot tilts. This is when memory programmable positions are of massive help. Just tune the head and foot sections to your desired angle, save them as your favourite positions and tune into the same by selecting the memory options as and when needed. 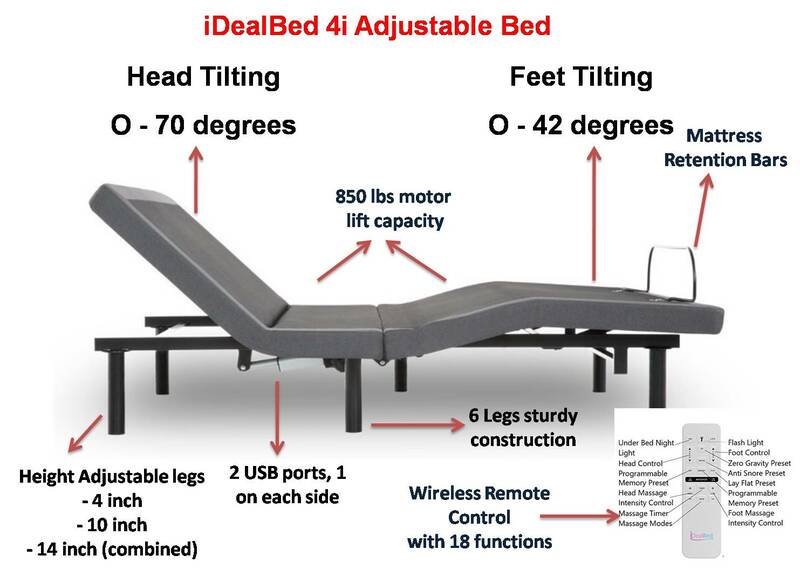 iDealBed adjustable bed offers 2 memory programmable positions. With 4 massage modes and 3 intensity levels, I don’t see any reason to say that this bed is not a high-end adjustable bed. You have wave, pulse and constant modes to select from and additionally the option of timing the massage as well. You can select either 15 minutes or 30 minutes as per your relaxation need. While in all other adjustable beds, you have to turn-off this massage function manually, whereas in iDealBed the massage function turns-off automatically. Just select the massage mode, set the time, and the bed will automatically turn-off upon reaching the set time. iDealBed 4i comes with 4 USB ports, 2 on each side. Whereas, iDealBed iEscape comes with as many as 8 USB ports, 4 on each side. These are again high speed charging USB C ports. While the remote has got the flash light option which works as your torch, there is again this under the bed lighting system embedded beneath this adjustable bed which helps you navigate to your bed in pitch dark room as well. Offering both flashlight as well as under the bed lighting system is not available even in advanced beds from both Leggett & Platt and Reverie. iDealBed iEscape: Both the flashlight and under the bed lighting system are LED in this new model from iDealBed. Height adjustability is an important factor as one height doesn’t really fit all. Take the case of a bed at 4 inches height, add another 10 inch mattress to it and then the total height would be around 14 inches above the ground. This is ideal height for most people. But people who opt for low height mattresses would be stranded at a height below 10 inches from the ground. This would be really awkward situation. Getting in and out of a low height bed is always a pain on knees. The more you bend, the more you strain your knees and it’s not a good thing in the long run. It is always in larger interest that height adjustability has to be offered so that we customers get the flexibility to enjoy sleeping at the right height. Height Adjustable Legs: iDealBed offers height adjustability feature as well. There are 4 inch and 7 inch legs and when combined they give you altogether 11 inches of height. iDealbed iEscape: Height can be adjusted to every inch in iDealBed iEscape. The leg units come with grooves and a hook offering 6 inch, 7 inch, 8 inch, 9 inch and 10 inch heights. 6 Leg Support: With two additional middle legs, iDealBed is relatively much more sturdy and durable when compared to other traditional beds. These middle legs add longevity by equally distributing weight across top, middle and lower sections of the bed frame while performing head and foot tilts. The bed comes with a mattress retention bar at the foot level. Additionally, the fabric covering the bed frame is made from non-slip material offering the right grip to hold the mattress in its place even while performing massage feature. iDealbed iEscape: iDealBed iEscape model comes with NanoHook mattress retention sytem. This unique and innovative feature removes the need to have retention bar. There are two parallel strips in middle and feet section of the bed that perfectly hold the mattress in its position. As a backup, mattress retention bar is also included in the package. iDealBed iEscape comes with emergency power backup as well. In case of power outage, the bed safely returns to flat position. 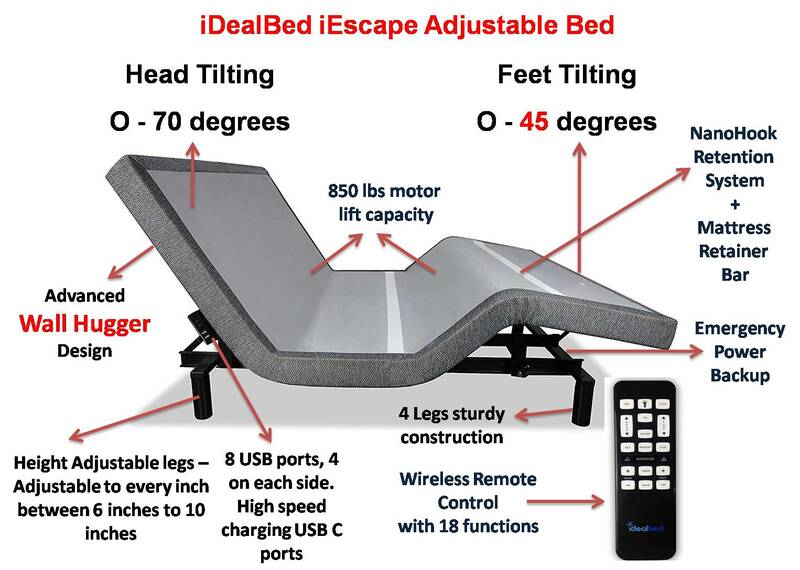 iDealBed offers 10 year warranty and iDealBed iEscape comes with 25 year warranty. This warranty comes from the renowned brand Leggett & Platt. Remember iDealBed has partnered with Leggett & Platt for design and even the motors installed are sourced by Leggett & Platt. With all these high-end features, I still keep wondering how did they seriously keep the price so low. The price is of a low-end bed while the feature set is on par with most mid-range and high-end beds. And look at the price, it’s still half of that of most advanced premium adjustable beds. Mainly, the design and motors coming from biggest brand Leggett & Platt is a big thumbs up. I fully recommend iDealBed for everyone who is on the lookout to enjoy the comfort of an adjustable bed at an affordable price.